Mad for Markers blog: Gorgeous Mermaids just released! Texture not only looks great but gives depth to an image! It stands out a lot more than if you had none. Grab some different fibers and play or play with markers you have on hand. When I opened my email I instantly fell in love with these digis and knew how I wanted to showcase them! Lots of color! How fun are these beautiful creatures! 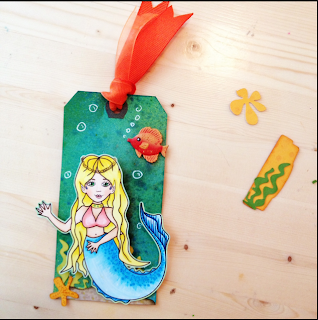 The color pallets to choose and the textures you can create are unlimited when working on these lovely mermaids. I was very fortunate to find little metallic fish at the Wal-mart but they only had one bad ..to bad :( . Lucky me! :) To top it off I gave it a pop of color by doubling the vibrant orange ribbon. Sammie's mermaid Kia Stormdancer was colored with Copics. To create texture on her tail I used Copic Spica glitter pen, just a little dab will do yah! :) As well as playing with dots using various shades of B & E.
Go check out these fun digis plus many more at Mad For Markers!